The Fijian archipelago sits in the Pacific Ocean, 1,300 miles north east of New Zealand, and benefits from spectacular beaches, a warm climate and stunning nature. The Fijian islands have something to offer everyone, you can stay in luxurious beach resorts, relax on spectacular beaches and enjoy the experience on a lifetime. Find inspiration for the best things to do if you would like to travel, go backpacking, take a gap year or plan a dream holiday to Fiji. Find inspiration for the best things to do if you would like to book a holiday, travel, go backpacking or take a gap year in Fiji. View travel advice on our guide including tips for places to go, the best packages available and get information about costs, accommodation, transport, health and safety and how to visit Fiji on a budget. 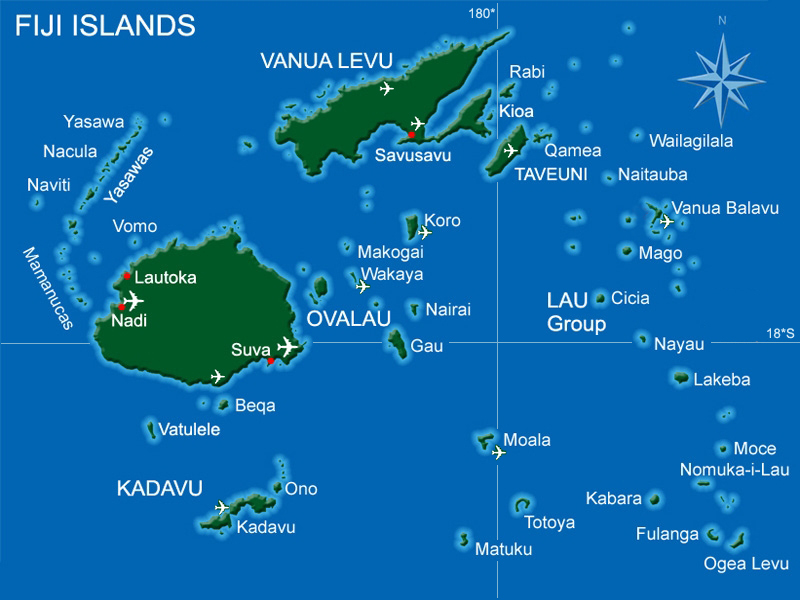 Language: In Fiji the official language is English, although Fijian and Hindustani are also spoken. In addition, approximately 57 per cent of the population are indigenous Fijians (primarily of Melanesian extraction or a Melanesian/Polynesian mix), while about 37 per cent of the population are descendants from India (known as Indo-Fijians), who were brought to the island nation in the late 19th century during British rule to work the sugar cane plantations. Fiji is made up of over 300 islands, many of which are uninhabited but there is more to this country than just beaches. Fiji has tasty food, night-life, historic sites and activities including hiking, kayak, surfing and snorkelling. Expect high mountain peaks, diverse lush nature reserves, exotic wildlife and tranquil locations. These attributes draw visitors from across the world, and for a number of reasons; whether it’s for a relaxing holiday, a stop on a round the world stop off, a romantic getaway or general tourism. Fiji really is a paradise and one of the most popular destinations on a round the trip, you might want to relax on tropical beaches or take part in adventure water sports. The remote location of Fiji makes flights quite expensive but you can get here from many worldwide international airports. The closest country to fly from is New Zealand which is approximately 2000km away. Some must visit places include the rainforest, a local village, the Bouma National Park and a ride on the Navua river. Viti Levu and Vanua Levu is where the majority of the population live and which are the two biggest islands, the other islands have around 100 people living on them so are pretty deserted. Expect a great range of budget and luxury accommodation, amazing beach huts where you an walk out onto pristine beaches and go swimming in crystal clear ocean. If you’re ready to experience the adventure of a lifetime, search our meaningful travel opportunities. According to Fijian myth, the original inhabitants of the archipelago were Chief Lutunasobasoba and his crew in 1500BC, who are said to have arrived from Tahanika in northern Egypt carrying treasures from the Temple of King Soloman. More likely, the original inhabitants were the Lapita people (likely from Vanuatu) who arrived around 1220 BC and called the islands Viti. Evidence suggests that they were only on the islands for a short amount of time before disappearing from the record. Tongan invasions began by around AD 1000 and continued on and off until the arrival of Europeans in the early 19th century. Although Abel Tasman sailed past the islands in 1643, it was Captain James Cook who was the first European to stop at Fiji in 1774. Legend goes that Cook asked some Tongans what the name of the island group to their west was, and heard them say ‘Feegee’, their pronunciation of ‘Viti’. 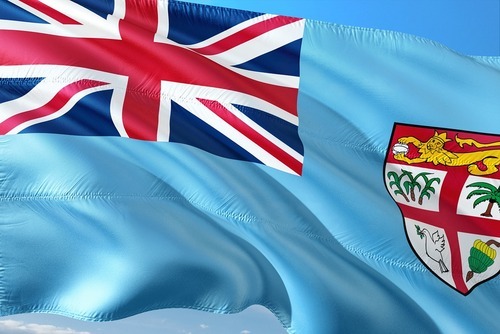 As a result, the name of the nation became Fiji due to an Englishman’s mishearing of a Tongan pronunciation. Fiji is made up of 333 islands spread over 709,660 square kilometres of the Pacific Ocean, but only about one third of the islands are inhabited by humans. This has made Fiji a getaway hotspot for reclusive millionaires after their own island. A case in point is Australian actor, Mel Gibson, who bought his own private island, Mago Island, from Japan’s Tokyo Corporation in 2005 for $15 million and now runs a cattle farm on the land. In Fiji, it is the Queen of England who has the paramount chiefly title of ‘Tui Viti’ – the traditional name for the Queen of Fiji. After Fiji decided to become at republic in 1987, the Great Council of Chiefs gave Queen Elizabeth the honoured position and it is not uncommon to find her image in homes and businesses throughout the islands. That said, the title is purely symbolic and does not give the Queen any constitutional or legal power in Fiji. Indeed, when it comes to leadership, Fijians have a strong respect for their cultural leaders and chiefs. For example, only the chiefs of the village is allowed to wear a hat, while one should never touch a Fijian chief on the head as it is seen as a declaration of war. Thomas Baker, a missionary, whose single shoe can still be found in the Fiji Museum, was killed by native Fijians where he accidentally touched a local chief on the head. In addition, always dress modestly when visiting a local village, and remember to respect Fijian customs. Often called the “crossroads of the Pacific”, Fiji straddles the 180th meridian and is one of the first countries in the world to welcome the new day. The nation has a unique location because the 180th degree meridian line actually runs rights through the country’s archipelago territory. Were Fijians to follow the time of the 180th meridian, they would have two different calendar days in the same country; however the International Date Line was moved to the east, resulting in all islands using the same date and time, 12 hours ahead of Greenwich Mean Time. From November through to February Fiji moves one hour ahead with its own daylight savings. Fiji is an all year round destination but you might want to check travel updates around cyclone season which is from November to April. The hottest time of the year is usually around December to January where temperatures are regularly over 30 degrees. During this time you can expect some rain though as rainy season runs from around October - April. May to October is a dry period for Fiji making this one of the best times of the year to visit. Thousands of tourists visit Fiji every year and this is generally a very safe country to visit, local people are very used to hosting tourists and will be very welcoming. The sun in this region of the world is extremely hot, you will need to pack accordingly and also take a good sunscreen whilst you might want to avoid drinking too much alcohol too, dehydration can be a problem due to the heat. Mosquitos carrying dengue fever is sometimes an issue, take a good insect repellent and also cover up your skin at night to prevent being bitten. Each Yasawa island has its own characteristics and qualities. The island of Kuata is perfect if you are looking for a traditional Fijian experience. Taken on face value, Kuata doesn’t appear to offer much entertainment, however there are activities available that give a real taste of island life. Kuata is dominated by monolithic mountains, so climb through the forest and take in the spectacular panoramic views across the Pacific. Follow this with volleyball on the beach, or eat fresh watermelon with the locals. There is also the opportunity to learn how to create jewellery using natural materials and traditional methods. Evenings on the island are not to be missed; food is provided by the village and is usually in the form of a buffet serving a variety of traditional Fijian cuisine. On certain nights, the locals partake in cultural dance and encourage visitors to join in. Manta Ray Island offers a different experience altogether. Situated in the ‘Blue Lagoon’ region of the archipelago, the island is visually stunning, with palm fringed beaches meeting colourful coral reefs. Diving and snorkelling are the main attractions here; the clear seas allow an unparralled insight of life in the ocean, with a variety of tropical fish and reef systems. The island derives its name from the manta ray, a species common to the surrounding waters depending on the season. When rays are spotted, the resort sounds a siren meaning a boat trip is departing to the area they are occupying. There is then the chance to swim with the rays, which can grow up to four metres in length. Be quick though as the boat doesn’t wait for long! In contrast with Kuata, the accommodation is a purpose built resort with dorm rooms, but it fits perfectly with the natural surroundings. The bar is set into the hillside, allowing visitors to admire the amazing sunsets whilst enjoying evening drinks. With a reputation as the ‘party island’, Beachcomber contrasts completely with the calm of Kuata or Manta Ray. It is the ideal destination for a final get together as the island is geared towards ensuring people have a good time. It is also the place to go for water sports; try parasailing or gliding for fantastic aerial views of Fiji. However this is not the island for people who like their own space; the accommodation comprises of one huge dorm room that houses 100 guests so don’t expect a lot of sleep! Fiji has something for everyone, so plan your trip to incorporate the islands that best suit you. Whether you want to relax, party or increase your understanding of a different culture, the welcoming locals and beautiful environment make Fiji a unique experience. You can find a range of bus trips and island hopping tours in Fiji. Popular tours include small group adventure tours, family tours, photography tours, wildlife / nature tours. There are so many adventure sports activities and excersions in Fiji you, you could join tours where you can go zip lining, explore treetops on walking tours. 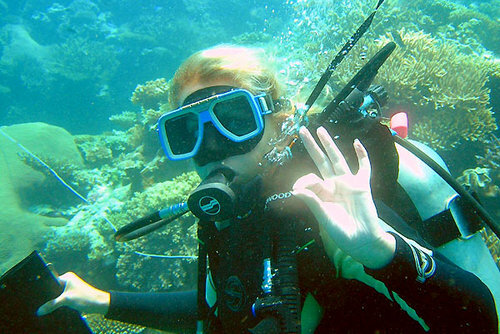 There are also options to learn to scuba dive and then join adventure day and night trips. From hiring a kayak and exploring the spectacular coral reefs to walking around the remote village of Kadavu, there are a lot of places of interest to visit. We recommend visiting Manta Ray Island which is spectacular or if you are seeking nightlife visit Beachcomber Island. The group of islands known as the Yasawas are highly recommended and are easily accessible from the port of Denarau and a designated catamaran runs a hop-on hop-off service most days. 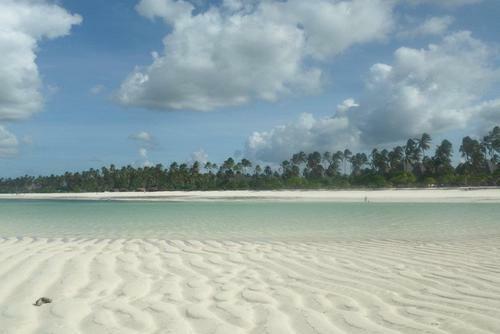 Tour companies may offer a stop at one of the three Mamanuca islands; South Sea is a tiny uninhabited island fulfilling the utopian ideal with its white sands, palm trees and clear blue sea. It offers fantastic diving as well as the option to sail by schooner to the island where Castaway was filmed, and visitors are encouraged to sample Kava, a Fijian drink extracted from plant roots. Travel is easy by small plane or boat and Fiji is a visitor friendly country with a variety of tourist attractions and package deals available for solo travellers, couples, groups and families. There are tours for all budgets including value and cheap tours to more expensive escourted group, private and luxury excursions. To join tours most operators will require you to be aged 18+. Some companies specifically offer trips for 18 - 30 year olds while there are more nieche tours like nature and marine based trips for groups/families. You can view dates and itineraries for tours in Fiji departing soon and next year, booking as early as possible in advance is recommended as spaces can fill up quick. When traveling on a tour in Fiji expect really friendly local people, stunning white beaches, a tropical climate spectacular clean ocean and palm trees to sit under and take in all the surroundings. You will get to see all the exotic islands and meet new people in a structured environment. 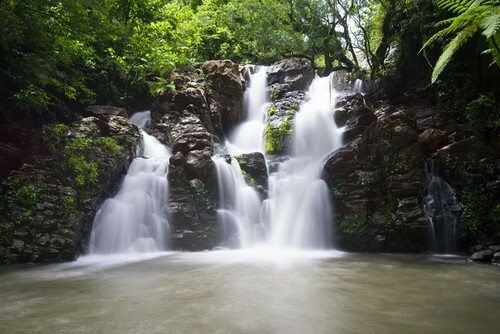 Fiji has a lot more to offer than just beaches though, you join sucba diving or snorkelling trips, explore the mountains on a trekking adventure. For sports enthauiasts there are jet boat trips, kayaking trips and white water rafting extreme trips down rivers in canyons which are spectacular. Search island hopping and adventure tours in Fiji today. There are also amazing island hopping boat passes which we highly recommended, Fiji has over 300 islands where are mostly deserted and boat trips are the best way to explore this tropic paradise. These island hopping tours can be booked in advance, we list companies on our website who can arrange them for you or also you can book on arrive at hotels, hostels and travel agents. You can also catch a ride with local people on smaller boats which can be an experience, don't let the shabby appearance of some boats put you off. Most of our tours specifically cater for the 18-35 age group and are a really popular option due to meeting other people, getting day-to-day activities, hotel check-ins, selected meals, accommodation and also transport/guides included in the price. Don't worry if you are slightly older, most tours accept all ages. Our featured trips are perfect if you are travelling solo and would like to meet other people and travel in a group. You will get to meet other international travellers and get taken to the best locations in the country with an experienced guide. Fiji is one of the most amazing destinations and is made up of 322 islands - each with its own cuisine, culture and identity. With One World 365 you can search amazing gap year trips and programs which are open to students, graduates, backpackers, career breaks or for anyone looking for the ultimate break. Fiji is a very laid back country to take a gap year in, and a lot slower paced than places, you could try to watch a local rugby game, enjoy some local culture or just recharge your batteries on this tropical paradise. You'll meet lots of other travelers in Fiji, even the larger two islands are relatively small and most people do the same bus route. If you are looking to relax then Fiji is the gap year destination for you, there are also so many water sports and even marine conservation programs you can help. We have gap year programs which are available to join all year round, these include island hopping trips and overland bus passes which allow you to explore the area. Fiji is a great country to go swimming or snorkelling, there is an abundance of marine life and coral reefs. If you would like to experience a true paradise, meet friendly local people, learn more about the culture and tradition of the islands, relax on white sandy beaches, see blue lagoons and go swimming, snorkeling or diving in crystal clear waters then Fiji will appeal to you. Before you depart we recommend signing up to a trip or buying a flexible Fiji bus pass where you can join structured trips around the islands. There are lots of routes and its a hop on hop off experience so totally flexible to work around your plans. This is also a good way to meet new people, make friends and enjoy a really fun experience. A couple of weeks is good amount of time to visit Fiji, there are lots of adventures you can book before departing for Fiji, these will allow you to travel in a group with others and see off the beaten track places. On Viti Levu and Vanua Levu you can take a bus tour or travel on public transport. There are guided companies which offer travelers a hop on hop off bus service around the islands. This is a daily service and connects most places of interest to visit, you can book this before departing. Viti Levu can take around 5 days to a week to see properly and there will be lots of ideas and cultural extras you can join. We are committed to ensuring that you enjoy the beautiful surroundings of the Fiji Islands. 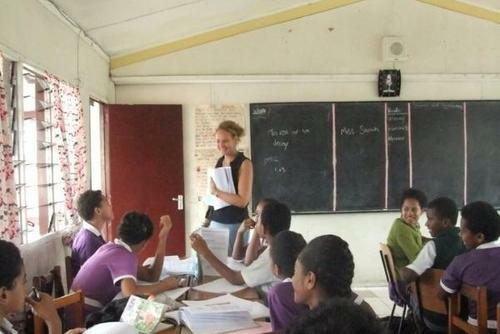 Therefore, if one of your goals is to enjoy the country that you wish to volunteer in, then Fiji would be your best bet! Your career break, gap year break or break will be one to remember when teamed up with volunteering and holidaying whilst in Fiji. Fiji is home to some of the most beautiful beaches in the world along with its landscaping, diving and cultural diversity, catering for all ages, it will certainly be a trip that you will never forget. Local organisations have been birthed out of the need that there ought to be a source of inspiration to each other using our skills and expertise to help and to build a bridge to each of towns and villages. If you are looking to give back and you feel that your call is to come and serve in Fiji we, there are orgs which can help create a really special experience. You can choose from lots of exciting placements for all different people and interests. Volunteering in Fiji will give you the experience of your life where you will also get free time to relax on beautiful beaches. You will develop an appreciation of what life is like for locals and as a tourist. Many tourists to Fiji only ever experience life as a tourist and this is the beauty of doing a volunteer project in Fiji, you can have them both! You will have lots of opportunities to sight-see as a tourist on weekends (or your days off), taking advantage of the best rates possible which is one of the benefits of booking a program with One World 365. For both small and large budgets you have we understand your needs and therefore there are a lot of great discounts available to you once you get here! There are lots of volunteer programs which you can find on our website - this is a great opportunity to live in paradise and explore some of the most remote and beautiful locations in the world. You will get to discover stunning nature and wildlife on marine conservation programs or you can help communities on land. You can help in several locations, a lot of programs are located in Yasawa, Nadi and Suva on Viti Levu - Fiji's largest island. There are also marine and sea based programs available where you might spend days out in the ocean researching and conserving nature. Please take time out to view the information below to gain an in-depth knowledge of volunteering in this beautiful country. Fiji is one of the most beautiful countries in the world with over 300 islands, there are stunning rain forests, coconut plantations, volcanoes, stunning shores and also diverse wildlife and marine animals which all need to be protected. There are over 4,000 miles of reefs and over 1,500 species of sea life surrounding the Fijian islands and on a lot of marine conservation programs you will spend time either on the ocean in a boat or actually going diving, swimming or snorkeling to carry out research. If you have never been scuba diving before you can be trained at an extra cost. The aim of conservation projects in this region is to monitor and help coral reefs and fish species survive long term. Tourism is a huge industry in Fiji but this has a negative effect on the local environment destroying wildlife areas and creating problems with rubbish. On some projects you will get to visit and work on deserted remote islands where you will get amazing pictures, tasks can include beach clean ups, help create land/marine protected areas and research/implement better long term plans beneficial to local people. On some placements you can gather research or work within local communities trying to get local people involved in conservation efforts. If you are passionate about animals there are placements and internships with wildlife charities in places like Nadi where you can help with the day to day running of a rescue and rehabilitation centre. No previous experience is needed but if you are already working in veterinary your skills will be put to good use helping dogs, cats and other animals. When you think of Fiji the first images which come to mind are while sandy beaches, clear blue waters and tropical beach hut style accommodation. But the reality of living in this country for local people can be far from this idyllic dream, a local World Bank study in 2009 said around 30% of the native population live below the poverty line. This is a due to a umber of reasons including the economy, job prospects and also basic education systems. As a community volunteer in Fiji you will get to help improve living conditions and provide better infrastructure for local people living in the country. The local Fijian government have implemented lots of community and healthcare programs with the aim of providing a better treatment for local people. Group building and construction projects are popular and a great way to make new friends whilst constructing buildings like schools, community centres and also better sustainable living facilities. Some of these trips work in 27 villages on the Yasawa Island where local people struggle with food and water shortages at certain times of the year. There are also medical and healthcare placements with local NGO's who are working to improve peoples health and living habits, so whether you are training, are already working in this capacity this experience might appeal to you. Sometimes you will get to help vulnerable members of society e.g. elderly, disabled and poorer people living in more remote regions of the country. To apply, you will need to be open minded, adaptable, flexible and most organisations will need you to be aged 18+. Anyone younger can request and your request will be looked into, there are special short term 2-4 week long trips for groups aged between 16 and 17 too - this offer an educational and structured experience. Gaining a visa to enter Fiji is fairly easy and programs can be booked in advance for 2017. Programs cater to gap year, career break and retired volunteers or whoever is taking a break from their normal day to day routine. As a volunteer in Fiji we believe that you should firstly have a heart to serve as most projects will test and stretch your abilities (mentally and physically) due to the way of living that we in Fiji are used to. Fiji is an outdoor country and so you will need to be able to work in hot/sunny conditions. Volunteering in Fiji is not all hard work, usually you will be required to help for around 5 hours per day with 2 days off per week meaning you will get lots of time to enjoy your surroundings. There is so much you can do during your free time too including sightseeing, relaxing or joining adventure sports. Accommodation usually comprises of either large dormitory style rooms situated close to projects, allowing visitors to live as part of the community. Sometimes private rooms and also home stays are available on request. 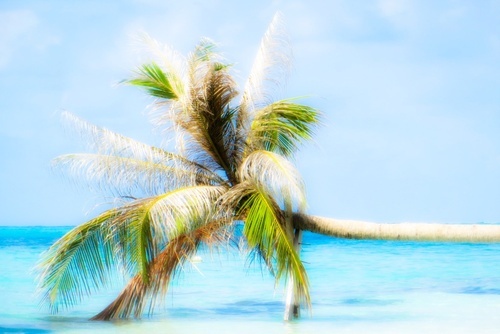 Facilities can be basic but more than adequate; hot water on some islands is rare so expect cold showers but this isn't a bad thing due to the warm climate. Living with a local host family giving you the very best of Fiji Island hospitality. In most cases you will have shared accommodation with other volunteers in the same home. Accommodation is simple here in Fiji and therefore you must come prepared not to expect living standards as you would back home. For example, some host homes may not have hot water for showers etc. You will take your breaks on the weekends or on your days off and this way you will see Fiji at your pace, along with understanding our day to day lives as Fiji Islanders. Most organisations including both international and local NGO's provide structured programs where you will need to pay a fee to participate. This can vary depending on the project / length of time you would like to join. The price you pay usually includes placements, orientation, training, transfers, accommodation, meals, in-country support and excursions. A portion of the price you pay also acts as a donation to local charities/projects and also helps support the local economy by providing wages to local people being employed. If you need any help arranging a volunteer placement in Fiji please get in touch. To get a paid job in Fiji you will need to be a skilled professional who can add benefit to local people/communities or run programs working directly for a conservation organisation for example. Finding low cost and free volunteer programs in Fiji can be difficult due to the popularity in terms of tourism for this destination, even if you apply to a local charity or NGO you might be asked to raise hundreds of dollars which goes back into work on the ground.